University of Portland Regional and Affinity Chapters are an essential part of our Pilot network. We annually recognize Chapters that have gone above and beyond in their service to the Pilot community. Chapter accolades are presented annually at the Alumni Leadership Conference during Reunion Weekend. The "Chapter of Excellence" status is given to Chapters whose efforts during a given fiscal year are exemplary. Criteria include welcoming and connecting alumni in their area, supporting UP students and faculty, strengthening branding, and increasing donor and volunteer engagement that go well beyond the minimum requirements for a Chapter. Chapters of Excellence receive additional UP support and resources that are consistent with their commitment to serving the diverse needs and interests of all Pilots and their families. All Chapters interested in the Chapter of Excellence status must apply by May 24, 2019. 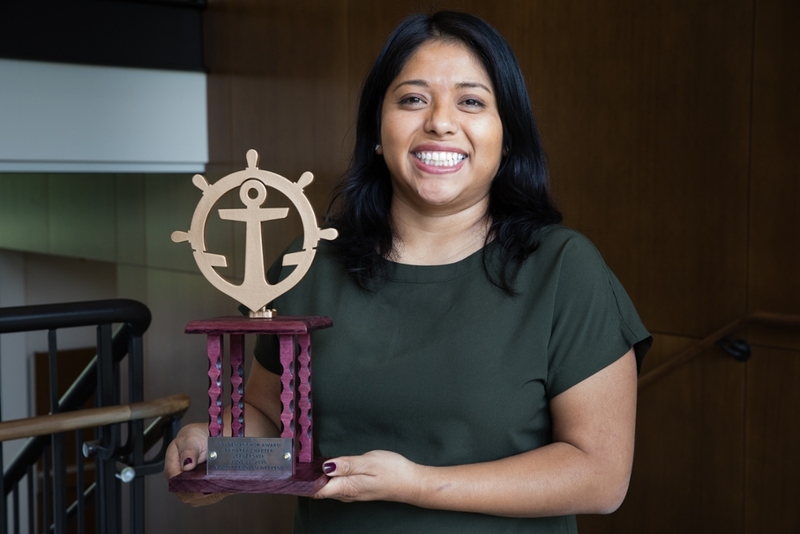 The Golden Anchor Award is presented annually to the Chapter with the most participation in Pilots Give, the University of Portland's 24-hour campaign to raise support from the entire UP community. Katie Scally ’11, President of the Bay Area Chapter, accepts the 2018 Golden Anchor Award on behalf of the Bay Area Chapter.